← 373 "Kiss Kiss Bang Bangalore"
"Until then, perhaps an old sea yarn may pass the time. Too bad I don't know any." The Simpson's are in a puzzle. Homer inserts his head on Maggie's and vice versa, but corrects it soon. The Wettest Stories Ever Told is the eighteenth episode of season 17. "While waiting for the dinner at The Frying Dutchman, the family starts telling three stories about ships: "Journey on the Mayflower", "Mutiny on the Bounty", and "The Neptune Adventure"." The Simpsons go to a dinner at The Frying Dutchman, but Captain McCallister makes excuses for not bringing them their food. It begins with the cook having trouble with the special (an octopus), then McCallister goes out to play basketball telling them their food will be ready soon. 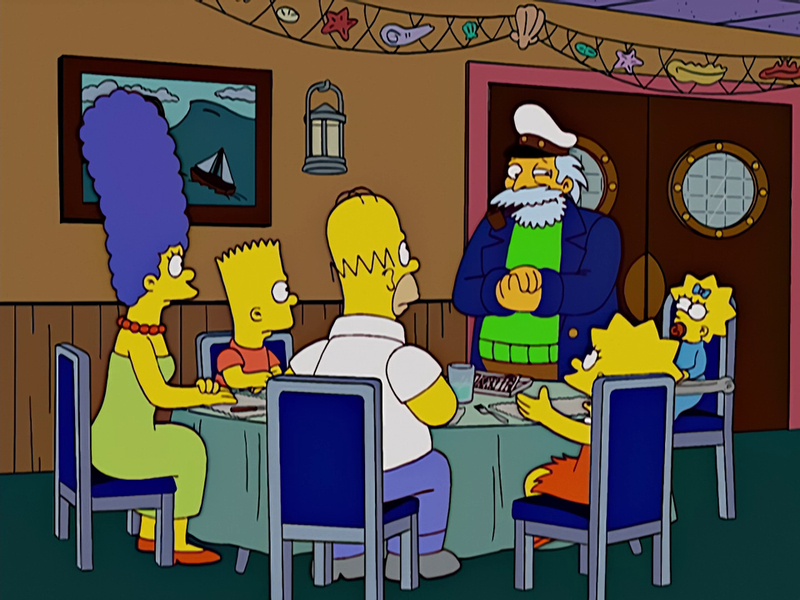 The Simpsons decide to tell stories about nautical theme - Lisa tells about the Mayflower voyage, Bart tells about mutiny in Tahiti, and Homer tells about capsizing cruise ships. Marge, Bart, and Lisa are about to board the Mayflower to head for the new world, but Homer runs ahead of them and hides in a barrel. The police is looking for him because of questioning why that era is called the "Jacobean era" when the king is named James, so they take him with them, only because they hear him praying (although he is actually praying for the family to be killed instead of him). Marge starts to like Homer when she sees how he strangles Bart in the same way her former husband used to, but Moe likes her as well and is instantly jealous of their friendship. To get Homer out of the way, Moe takes him down to the storage room where all the beer is held and tells him to drink whenever a wave hits the boat. However, it is actually forbidden to drink beer on board the ship. He gets drunk along with almost all of the other passengers. Captain Flanders and Reverend Lovejoy discover them and place Homer in a stock after Moe blames him. Then, a storm approaches, and Flanders gets knocked out. Homer claims that he steers better when he is drunk so, while drinking a bottle of wine, he leads them safely out of the storm. He and Marge get together, and they all make it to the New World. While having the first Thanksgiving with the Native Americans, Flanders says that he is almost sorry for what the Pilgrims will do to them later, take their land and kill them. The HMAV Bounty sets sail from England, commanded by Captain Bligh (Skinner). He severely mistreats his young crew, tossing their mail off and confiscating it for himself. They arrive in Tahiti, where the kids have an unforgettable vacation, but Captain Bligh later orders them to forget the vacation. Willie warns him of a mutiny, but Bligh ignores him. Eventually, First Mate Bart Christian leads a mutiny. Bligh, now realising Willie may have been right, says they could have a suggestion box, before Nelson points out that Bligh already made one out of the head of the last kid who had a suggestion. They then send Bligh and Willie off in a lifeboat. Bligh taunts Willie into mutiny and is sent away on a sea turtle, who he then starts to mistreat before it dives. Bart, now the captain, orders the crews to set sail for Tahiti then he throws away the ship's wheel and they crash into Antarctica, where the crew tell him he is going the wrong way. Homer's story takes place on the luxury liner Neptune on New Year's Eve. Captain Burns doesn't see a massive freak wave and the ship capsizes. With the ship upside-down, the survivors Homer, Bart, Lisa, Marge, Lenny, Carl, Comic Book Guy, Old Jewish Man, his wife and Sideshow Mel, all led by Selma, ignore Purser Wiggum's advice to stay put in the ball room. They instead decide to climb up the decks to the engine room and, while climbing up through the smokestack, Lenny panics and falls to his death. They encounter in rooms in flames, tigers, and Homer doing his business in an upside-down bathroom. Comic Book Guy swims through a flooded deck with a rope to help the others get to the engine room, but he has a heart attack when he swims back and dies. The group makes it to the engine room, but Sideshow Mel's hair is set on fire because of a blowtorch from the rescue team and he passes out. The rest of the original group makes it off the ship, at which point they encounter the walking skeletons of the Bounty crew (from the previous story), who are still trying to get back to Tahiti. Captain Bart asks them where is Haiti, then the other complain about being lost for years. Modified on March 6, 2019, at 02:17.